It’s National Parks Week 2017 (24th July – 30th July) which is an annual national celebration of all things national park. There’s some really great activities and events running across the UK’s national parks for everyone to join in with – from adventures for beginners, walking and cycling routes, spotting wildlife challenge or ‘earth exploring’ with the kids. Being outdoors is a great way to keep healthy, get some exercise and improve our mental well-being and emotional health. Being surrounded by clean air, wildlife and the stunning natural beauty of the environment can be a great way to recharge your batteries! Whether that’s a get-together with family and friends or a quiet time to just enjoy the tranquility on your own. In Britain we have 15 National Parks and in Scotland we are really fortunate to have the impressive Cairngorms National Park which is the largest National Park in the UK, and the stunning Loch Lomond & The Trossachs National Park. The National Parks website has a great page Access for All where you can find out more information on trails designed to accommodate all abilities, mobility vehicle hire, accessible toilets and parking for disabled people. There are lots of places in the Park with easy access, and a small number of organisations which provide accessible outdoor activities and facilities such as Adventure Unlimited who specialise in activities for people with disabilities. There is also a dedicated webpage Cairngorms – Access for All which lists lots of useful information on accessible paths in the park, where to stay and community transport. We’ve listed some information on accessible walks below, but there are plenty more on their website to check out. 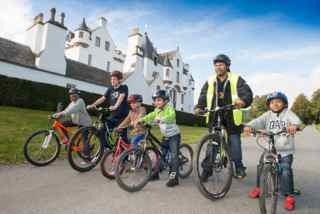 Atholl Estate at Blair Atholl is home to the grand white-walled Blair Castle with plenty wheelchair friendly paths passing through the beautiful castle grounds. Craigellachie National Nature Reserve by Aviemore offers a wealth of wildlife watching opportunities from the easy access Lochan trail. Glenlivet Estate, Tomintoul provides some easy access trails and visitor centres to help you discover the rich history and landscape of this special place. Glen Tanar National Nature Reserve near Aboyne has lots to offer from visitor facilities to easy access trails through native woodlands, and a ranger service to support your visit. You might also find it useful to check out Euan’s Guide, a disabled access review website. There are some reviews of accessible adventures in the Cairngorms National Park. There are many paths in the National Park that provide particularly good opportunities for disabled people or those looking for easy gradients and smooth surfaces in a variety of scenic locations. Check out the All Abilities section of their website for more information. We’ve listed a few local places and things to do below. Aberfoyle – village is suited to visitors with limited mobility as the area is generally of a level nature. The village has cafes and restaurants with disabled facilities. Balloch Village (including Balloch Castle Country Park Scooter Routes). View the Balloch Castle Country Park scooter routes. Callander – town is suited to visitors with limited mobility and has many cafes/restaurants and hotels which have disabled facilities. Coulam wheelie boat can be accessed by pier/ramp. Wheelchair is lowered by hydraulic lift and equipped with an easy starting pull start engine. The Fisheries also has a landing craft type front loader and electric start engine. If you need any further information on accessibility of any of the national parks you can also get in touch with the National Parks at info@nationalparks.gov.uk. If you are unable to get to one of the national parks or just want to get out and about closer to home, there are some great local walks and activities in and around nearby cities and towns in the UK. We’ve listed some organisations that can provide information, advice or support. Paths for All is a Scottish charity that champion everyday walking as the way to a happier, healthier Scotland. You can search their online directory for a walking group in your local area. Their Health Walks are short, safe, social, local, low level, with a trained leader to show you the way. You can also find out about wheelchair friendly walks and Dementia friendly walks which are available in some areas. The Disabled Ramblers exists to help disabled people to get out into the countryside. They ramble in all weathers and over a variety of terrain. Rambles are graded according to difficulty. A few are suitable for shopping buggies and power chairs whilst most need large scooters capable of travelling over rough ground. Their website includes links to local disability rambler associations, and many local rambling groups have a number of scooters for use if you don’t have your own. In Scotland there are 3 groups: Forth & Tay Disabled Ramblers, Highland Disabled Ramblers and West Lothian Disabled Ramblers. The Ramblers also have a helpful guide for people with limited mobility and wheelchair users. How to find a suitable walk? Phototrails is a new and expanding database of trails in the UK and around the world. It was developed by the Fieldfare Trust – a charity that actively promotes countryside access for people with disabilities. Fieldfare understands the importance of providing “pre-visit” information on trail features and site amenities, such as whether disabled parking and accessible toilets are available. Each walk is described through a filmstrip and slideshow of photographs which let you see just what the walk is like. They include information on the surrounding environment, the walk distance and the features and highlights that you will find along the way. Each trail is given an accessibility rating to help you decide whether a trail meets your needs. The Forestry Commission Scotland website provides information on accessible routes. Choose an area or town and click on ‘filter by activity’ and then select ‘easy-access trails’. The Heritage Paths Project website has information on unusual walks such as old routes that have been used for a specific purpose: The paths include Roman roads, pilgrimage route and miners’ paths. You can search for suitable routes for motorised scooters. Walks with Wheelchairs is a UK web-site dedicated to providing free information on routes that are suitable for those that use a wheelchair. There are a few walks listed for some areas in Scotland. Walking on Wheels – 50 Wheel-Friendly Trails in Scotland (2006). Guide for wheelchair or electric scooter users who wish to enjoy the Scottish countryside. This is an older book but copies still being sold on Amazon. Scottish Outdoor Access Code. You can find out more about everyone’s access rights and responsibilities in Scotland’s outdoors. Access rights in Scotland apply to most land and inland water. Outdoor access rights apply whether you’re a member of the public wanting to enjoy some fresh air in a local park, or a dog walker, hill walker or mountain biker. There is a section on access rights for mobility scooters. Access rights extend to being on or crossing land in a motorised vehicle or vessel which has been constructed or adapted for use by a person with a disability and which is being used by that person. Follow the Highway Code at all times. If you are using such a vehicle or vessel, take care to avoid disturbing animals or wildlife, and respect the needs of other people exercising access rights and the needs of land managers. There are many accessible walks and trails in Scotland. We’ve listed a selection of different types of walks but please do get in touch by calling our helpline on 0300 323 9961 if you need further information or to find out about walks in your area. Although many are historic buildings there are a lot of walks in countryside areas and also grounds of other properties. There also have a list of walking trails many of which are accessible. You can contact them before setting out on a trail to make sure it’s suitable. Schiehallion (one of Scotland’s most popular mountains) has been named as the first Munro that is considered wheelchair friendly. Schiehallion, which stands at 3,547 feet, was approved as being wheelchair accessible by the FieldFare Trust, who suggested that the path to the summit of East Schiehallion from the Braes of Foss car park would be suitable for those in wheelchairs for the first third of the journey, with the second two thirds of the journey being up to the individual to assess whether they can manage to make the ascent successfully. We hope you feel inspired to get out there! If you know of other accessible walks or trails, or want to share some tips, please get in touch and leave us a comment.